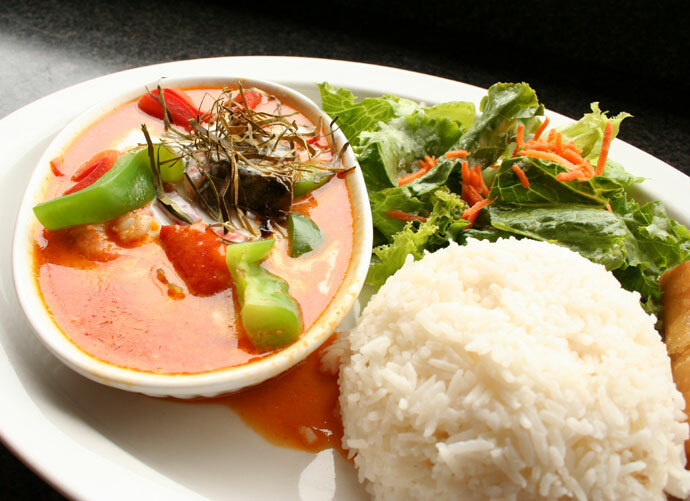 Another visit to Thai Away Home (address: 1206 Davie Street, phone: 604-682-8424) and this time I enjoyed the Penang Curry with prawns (pictured below) which was served as a combination with soup, salad and rice for $9.95. At Thai Away Home you can order take out (which is what many people do), or order at the counter and then eat in the restaurant. This tiny restaurant has won awards in the local newspapers for Best Thai in the casual / take out category. (Click here to view another picture from this restaurant -Part 1). 47,507 views. This entry was posted on Sunday, September 2nd, 2007 at 12:28 am	and is filed under Affordable, Asian, Casual, Chain Restaurants, Comfort food, Curry, Davie Street, Downtown, Fast Food, Favorites, Food Photos, Lunch, Lunch Specials, People Watching, Reasonably Priced, Restaurant, Take Out, Thai, Vancouver, Vancouver Restaurants. You can follow any responses to this entry through the RSS 2.0 feed. You can leave a response, or trackback from your own site.